Managing employee wages can be a tedious task, but Teachworks offers a number of features that can help to streamline the process. You can easily set hourly wages for lessons and non-teaching events and these rates will automatically be applied when events are scheduled in the calendar. Teachworks caters for non-hourly compensation, and this can quickly be added to an employees personal “Hours & Payments” page. 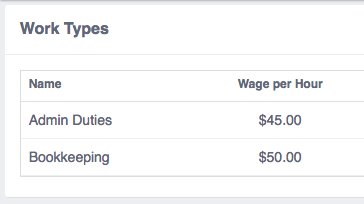 We also have a “Wage Tiers” feature that allows you to specify different wages for the same service type. This article will explore these features in some more detail. Settings for calculating lesson wages can be added directly to an employee’s profile under the “Employment Details” section. When lessons are scheduled for an employee, the settings specified on their profile are used to determine wages for their lessons and their hours and earnings are automatically added to the Employee Hours Page. With this Lesson Wage type selected, the hourly wage specified in the service list is used to determine the wage for lessons. If you have non-teaching staff, such as office administrators or bookkeepers, and you’d like to log their hours, you can add “Other Events” to the Teachworks calendar. This is also useful if your teachers have a secondary role that doesn’t involve teaching. Non-teaching wages can be set directly on a teachers profile, or you can specify wages in the Work List. For more information about tracking non-teaching hours more efficiently, you can view this article: Tracking Non-Teaching Hours. You can also add non-hourly compensation to Teachworks. This is useful if you want to record things like bonuses, referrals, salaries or reimbursements. To record non-hourly compensation, you can go to the Employee Hours page and find the relevant employee in the list and click the magnifying glass icon in their row. This will direct you to the employee’s lesson hours, other hours and other compensation. Next to the heading for “Other Compensation”, click the “Add” link to add non-hourly compensation for the employee. Teachworks also has a Wage Tiers feature that allows you to set different hourly wages for the same service. This feature is useful if you pay teachers based on their experience, or based on the number of years they’ve been working for you. If you’d like to pay teachers based on their years of experience for example, you could set up wage tiers for 1 Year, 2 Years, 3 Years etc. Teachers with less than 1 year experience would then be included in the default tier. 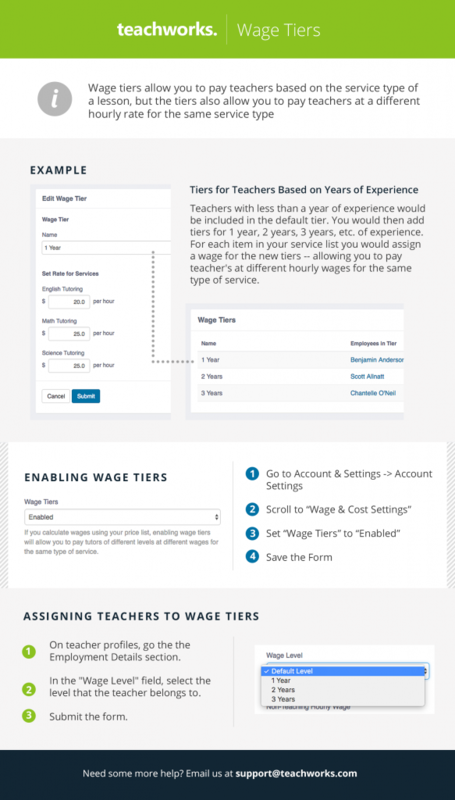 For each item in your service list, you will be able to assign a wage for the new tiers — allowing you to pay teachers at different hourly rates for the same service. To enable Wage Tiers, you can go to the Account Settings page in your Teachworks account and scroll to the “Wage & Cost Settings” section. From here, you can set “Wage Tiers” to “Enabled”. 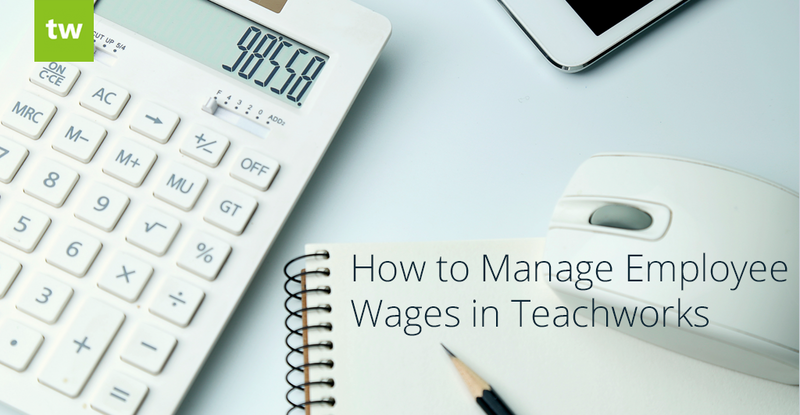 After you’ve created the various wage tiers, you’ll need to assign them to the relevant teachers. To do this, edit their profile and scroll to the “Employment Details” section. In the “Wage Level” field, select the level that the teacher belongs to. When you schedule lessons or non-teaching events, the employee’s hours are automatically calculated. You can view employee hours under the Employees tab by clicking the “Employee Hours” option. From here, you can view a detailed breakdown for each employee by clicking the “View” icon in their row.